Faced with intense and growing competition from GPS-enabled smartphones with free navigation software, TomTom (TMOAF) announced Wednesday it is seeking to broaden its revenue base. The popular Dutch developer of portable navigation systems for cars, bikes and now smartphones hopes to chart a sustainable course against the likes of Nokia (NOK) and Google's (GOOG) Android, which offer up free navigation software on smartphones. 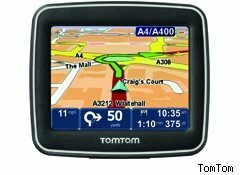 TomTom's software and devices include roughly $90 for a Windows-based TomTom navigation system and up to $470 for a TomTom car kit. The company has also been slashing prices on its iPhone app. During its third quarter earnings announcement, TomTom CEO Harold Goddijin said: "Our Consumer business unit performed well in a soft market through strengthened market share, slowing price declines and an increased contribution from service and subscription sales. We made good progress in securing new automotive contracts and our Business Solutions unit continues to deliver strong increases in subscriber numbers. We are focused on broadening our revenue base and on rolling out high quality content and services to our customers and I am pleased with the progress we are making." TomTom's revenues rose 3% in the quarter to $519.4 million, compared with last year. While the company didn't offer up an expansive explanation in their earnings statement of what precise measures it will take to broaden its revenue base, it has begun offering a personalization service to spiff up the appearance of its devices -- similar to the personalized protective casings users can get for their cell phones. In the meantime, it declined to comment on whether it is still holding talks with prospective buyers, according to a Reuters report. Earlier in the month, Goddijin said in a published report that the company has declined a few buyout offers. According to Reuters, analysts believe Microsoft (MSFT), Google or Samsung would be the most likely candidates to make an offer.